We have mixed feelings about this $85 dash cam unit. It does the job, it’s relatively inexpensive, and it has a rear view camera monitor built in to the mirror. However, the blue tinted mirror is weird and the video image can wash out in bright light. Overall, it’s worthwhile if you want a dash-cam and backup camera, but there might be better options if you want a dedicated rear-view monitor. We just installed this Auto-Vox M2 1080P HD dash cam and used it during a multi-day trip. Records both the front-facing and rear-facing camera to a micro-SD card. A 32Gb card is included, which stores a couple of hours of footage in two-minute chunks. AVI format files are easily readable. Optionally records cab sound from a microphone in the unit. Mirror shows just the front or rear camera, picture-in-picture (either way round), or side by side shots. The up-arrow button on the base of the unit switches views. Built-in rechargeable battery so you can set it to turn on and record footage if it detects a shock while the engine is off – for instance if you get hit while you are parked. Rear view camera can be used either with or without backup lines. It’s wide angle, so it’s good for seeing into your blind spots. Rear camera connector is very thin diameter, making it easier to install. 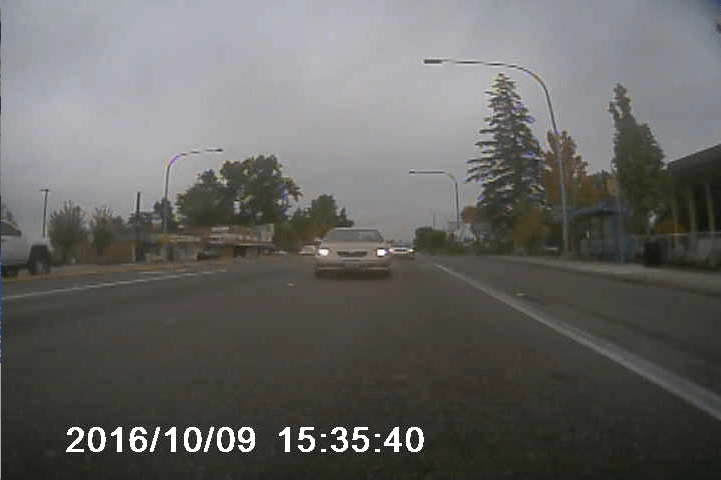 The image quality isn’t crystal-clear, but it’s good enough when you’re driving, and would probably be clear enough to establish who was at fault in an accident. 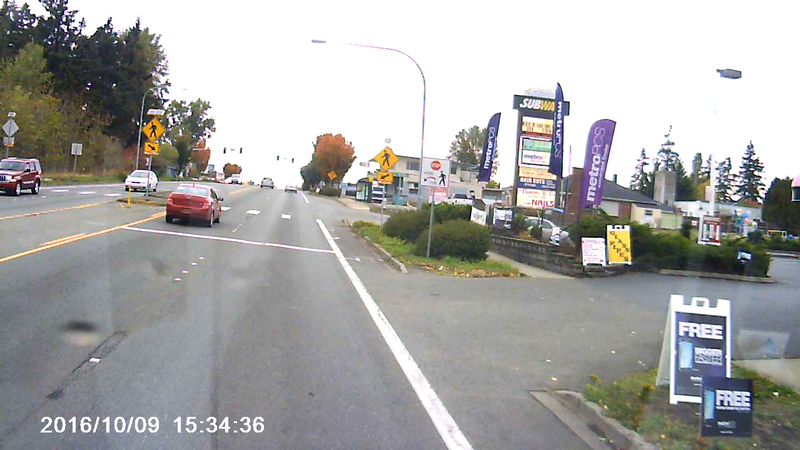 Here is an example image from the front and rear camera, taken at around the same time on a rainy day south of Seattle. Click either image to see it full-size. The mirror unit isn’t very visually appealing. Why did they put a gold band around the mirror? Why did they color the dash camera gold? It’s chintzy and draws attention to something that should be blending in to the background. We ended up putting some black tape over the gold pieces. Not pretty, but less distracting. The mirror has a blue tint. The interior of the van looks quite dark in the mirror. It doesn’t help much with headlight glare. You can still access the regular mirror’s night-time switch thing at the base of the mirror. The camera plays a musical chime every time you switch it on or off (so, when you start/stop the engine). I keep expecting a flight attendant to give me a safety briefing. The monitor image in the mirror is not too distracting at night, but it washes out during the daytime when the sun is ahead of you or directly behind, shining on the mirror. Brightness is adjustable though. The rear view camera image is much too wide angle to give a realistic idea of car distances behind you. It’s not a rear-view camera so much as a backup camera. Mounting the rear view camera over the license plate leaves it susceptible to road spray. It doesn’t give a good image when you’re driving in the rain. The front camera picks up reflections from the dash area. 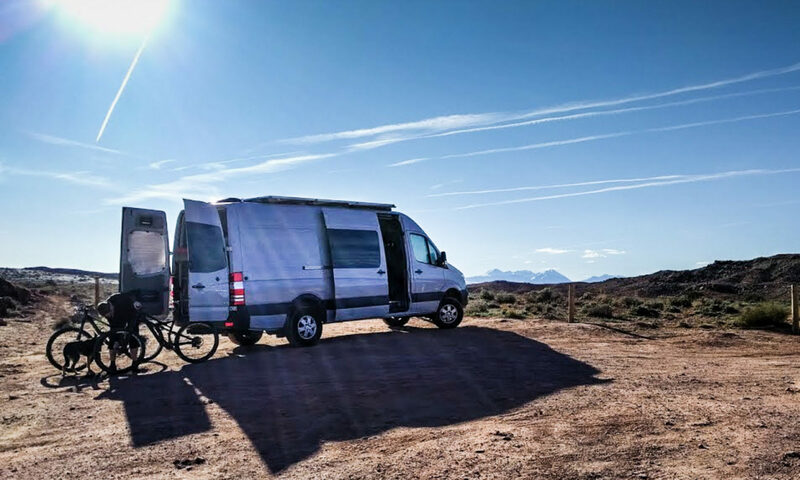 That’s probably pretty much unavoidable with this type of unit in a Sprinter. The camera lens would have to be right up against the glass to prevent reflections. The product description is slightly misleading. The unit will accept a 1280×720 pixel input from the rear view camera, but the model that ships with it is a 480 line version. The image is good enough resolution, though. 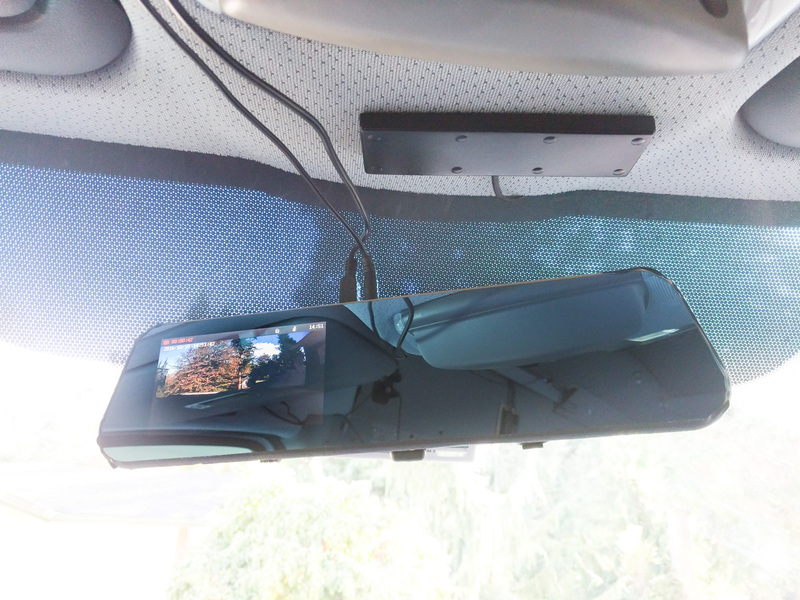 Overall, the unit is useful if you want a dashcam and a backup camera, but it’s not the best choice if you’re intending to use it as a replacement rear view mirror, like we were. Installation of the dash cam is simple. You hook the unit over your mirror using the supplied rubber bands. It fits over a Sprinter mirror just fine. You then run the power cable to a place where you can plug it into a cigarette lighter socket. It draws three Amps. We have a house 12v supply just behind the cab at head height, so we plugged it in there. If you have the optional cubby in the headliner you could wire it there for a neater install. 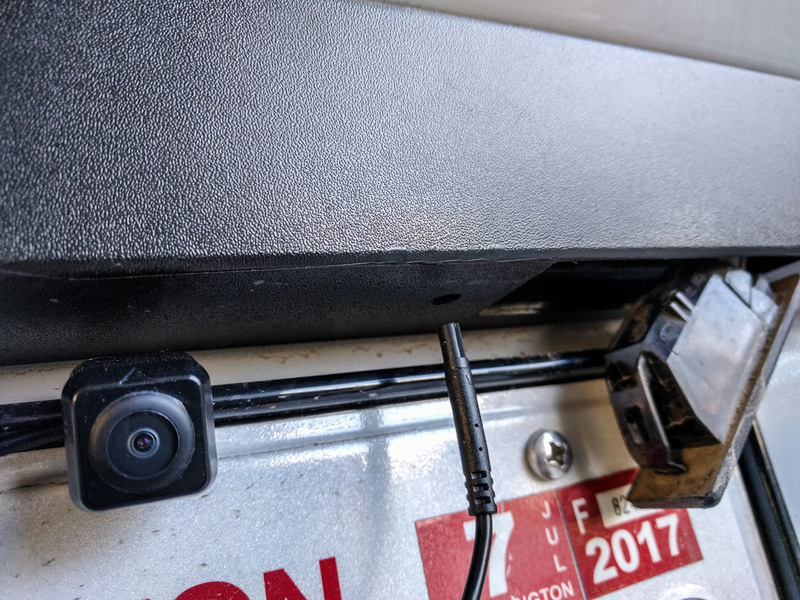 Then you need to run a cable back to the rear doors to mount the camera on the license plate with its handy-dandy bracket (which really does work very well). Hardly surprising given the length of the van, you’ll need an extension cable to make the camera reach from the back door of the van to the mirror location. It’s a 2.5mm male to female four connector cable. They’re often called TRRS (tip, ring, ring, sleeve) cables because that’s how the conductors are laid out on the plug. Ours cost $7. A three connector (TRS) cable will not work. The 2.5mm size is smaller than headphone jacks (3.5mm) too, so be careful what you order. Use this extension cable between the mirror and the rest of the cable that comes with the unit. That’s because the end of the cable closest to the camera is non-standard, and that’s for a good reason. One very nice thing about this particular model is that it has a small diameter connector on the camera. Rather than a regular RCA video jack and separate power cable, the camera cable terminates with a 2″ long, thin plastic tube that has four very small pins in the end. The whole thing fits through a 1/4″ hole. That makes it much easier to pull the cable through cavities. And you’ll be doing quite a lot of cavity pulling. First, you’ll need to drill a hole to get the camera cable from the license plate area into the rear door. We just drilled a 1/4″ hole in the underside of the black plastic trim that houses the license plate lights. Removing one of the license plate light fixtures makes it easier to feed the cable through. A trim tool or screwdriver hooked under the end closest to the driver’s side of the light fixture should unclip it relatively easily. Once it’s through the trim piece, the cable end has to feed through a grommet to the inside of the back door. Remove the door panel on the driver’s side rear door, and find the grommet. It’s in the metal inside the door just above where our hole is on the outside of the door. The grommet has a boot on it which will make it almost impossible to feed the camera cable through in place. 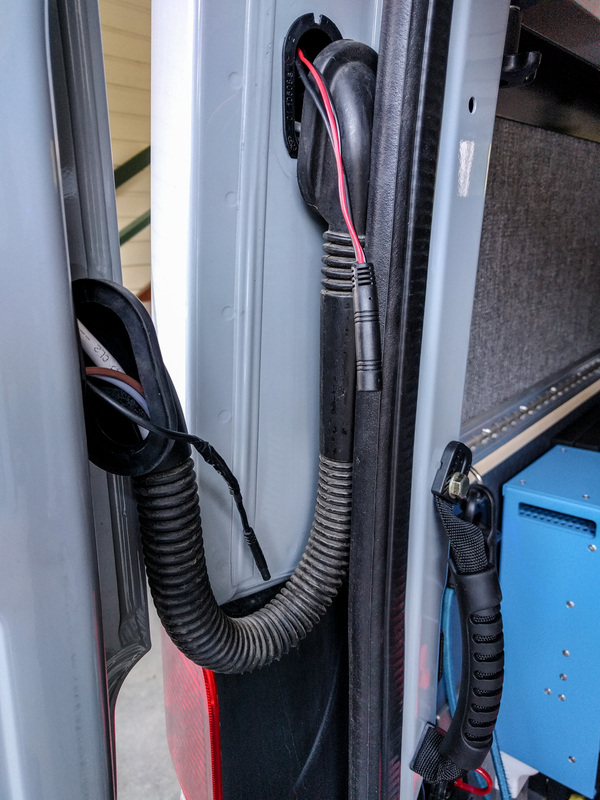 I suggest you pull the grommet out of the hole towards the inside of the van, then use a wire fish from the inside to the outside to hook up the cable and pull it through. In the picture above, the camera wire is already through the hole in the black plastic trim. Then I pulled the cable back out through the license plate light cavity. That made it easier to tape on to the wire fish, which I’ve run through the grommet hole from the inside of the door. Pull the camera cable through the hole on the wire fish, feed it through the grommet, and then slide the grommet back down the wire and re-install it in its hole when you’re done. Now the wire must get up to the flexible boot between the door and the body of the van. We already wrote about how to take the flexible boot off and re-install it. 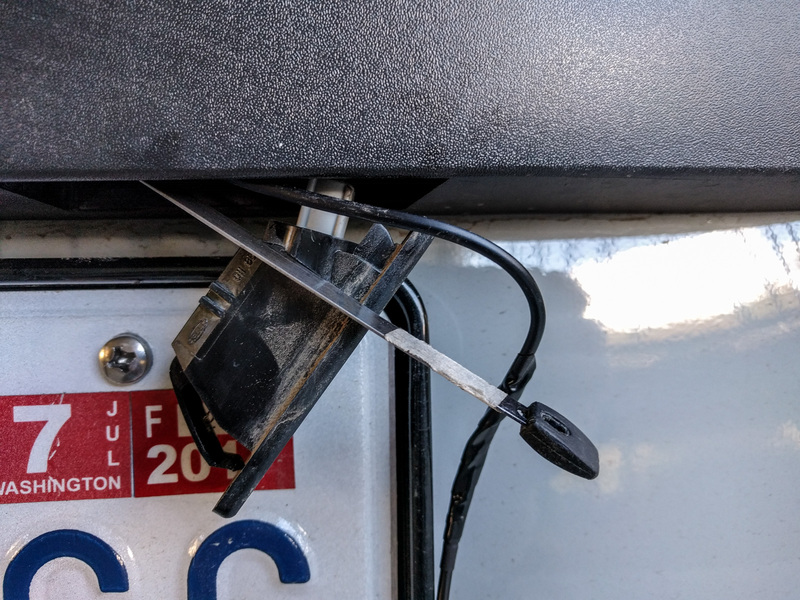 Once you know that trick, it’s pretty easy to use a wire fish to pull the camera cable up from the inside of the door at the license plate area through to the flexible boot. That’s pretty much all the length that this camera cable has. Now you need to work the other way with the other part of the cable. We ran ours along the top of the driver’s side wall, following the Mercedes factory wiring loom. We used a wire fish to pull it down through the D pillar and out at the vehicle side of the flexible boot. Unfortunately, it’s this slightly thicker connector that has to make its way through the flexible boot. Again, the wire fish and some hard tugging will get it through. Make sure you feed the cable through all the component parts of the flexible boot. If you miss out threading it through one of the plastic connector things at the end of the boot, you’re going to be cursing. Now, you can connect the camera to the cable that runs to the rear view mirror/monitor. 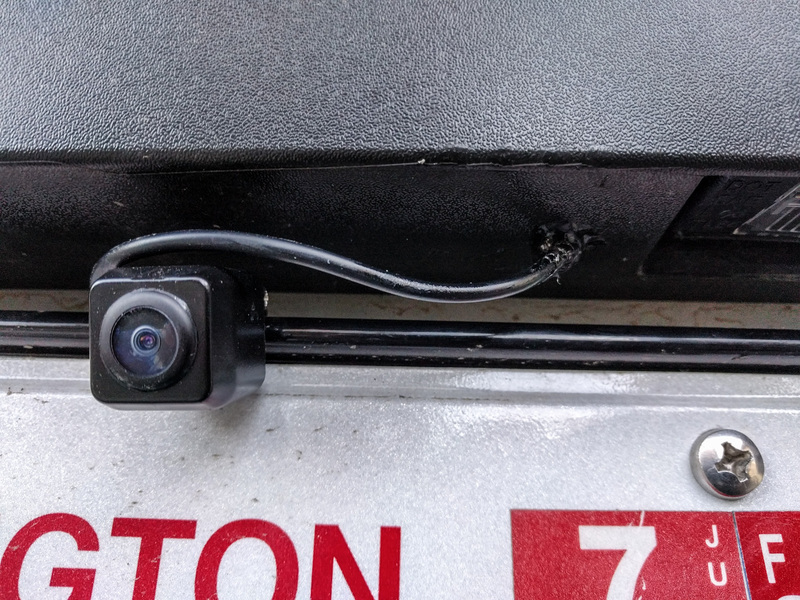 If, like us, you want the rear view camera to be on all the time, then you do NOT need to connect the red and black power cables that are attached to the cable here. They are used to activate the camera when the reversing light comes on. With them detached, the camera just works all the time. We taped them to the main cable with some electrical tape to keep them out of the way. If you do want to use the reversing light as a backup signal, you can get to the bulb from this part of the D pillar pretty easily. Just remove the light assembly and splice into the reversing bulb. Test that you get a signal from the camera on the screen before you put the boot back in place and replace the rear door trim! One final step is to slop some sealant around the place where the cable enters the plastic trim above the license plate. Marine Goop or black silicone will both work here. Probably not 100% necessary, but good practice anyway. The rear view camera is advertised on Amazon as being 120 degrees field of view. It’s actually 140 degrees. For comparison, a 50mm lens on a regular 35mm camera system (considered “normal”) has 40 degrees field of view. That means things look very far away from you even when they are close. Cars get very tiny and almost disappear from view even when they are just a few hundred feet behind you. In the sample image above, the car is only a few feet behind me in real life. It’s great for backing up (and you can enable backup lines on it), or for seeing what’s in your wing mirror blind spots, but it’s not so good for a full time rear view. We started off with just a regular $20 wide-angle rear view camera and a cheap 7″ monitor very much like this $25 one (they all appear to be the same generic monitor with different names applied). We attached the camera to the bed platform inside the rear window, just so that we could experiment with using it as a rear view mirror alternative. We’re glad we didn’t do a permanent install with that setup. The 170 degree camera was way too wide to be a rear-view camera. That’s one reason we started looking at other options. If you could find a camera with a narrower field of view, or if you’re using it just for backing up, the size of the 7″ screen was nice. You can also get full-perimeter camera systems. These offer split screens where you can see the output from one camera and also a stitched-together view around the entire vehicle. It’s tempting to try one of these out, but they all look just as cheaply made as the rear view mirror monitors. We’ll keep using this dashcam/backup camera combination for a while, and report back when we’ve had more experience with it. At the moment, we’d cautiously recommend it as a dashcam and backup camera, not so much as a permanent rear view camera. not sure if you still have this dashcam, but I bought one similar and what I did was remove the stock rearview mirror bracket from the windshield, break the glass, remove the outer casing (leaving intact the ball joint), then using 3M VHB tape, I mounted the dashcam directly to the balljoint. Had to tuck in the ‘straps’ with some black twist ties. Thanks for this tip, Ryan. Nice work! There are also third party clamps that fit on the ball part of the rearview mirror bracket. Really??!? I was looking for one but couldn’t find. Do you have a link for one? Ryan, I didn’t buy one in the end, and now I can’t remember whether it was a 15mm or 17mm ball socket. Here’s a link to a 17mm one (the size Garmin uses for their Nuvi products). From that link you can probably find more like it. Some of the tripod ball head mounts for smaller cameras use a 15mm ball. I hesitate to link to one in case it’s not the correct size. Definitely measure the ball diameter before ordering anything – I’m afraid I just can’t remember what the measurement was. Where did you get the slider box for the toll transponder? Jason, that slider box comes as part of the package from Washington State DOT. It’s called a Flex Pass.